Purpose: To evaluate the impact of low vision rehabilitation on functional vision of children with visual impairment. Materials and Methods: The LV Prasad-Functional Vision Questionnaire, designed specifically to measure functional performance of visually impaired children of developing countries, was used to assess the level of difficulty in performing various tasks pre and post visual rehabilitation in children with documented visual impairment. Chi-square test was used to assess the impact of rehabilitation intervention on functional vision performance; a P < 0.05 was considered significant. Results: LogMAR visual acuity prior to the introduction of low vision devices (LVDs) was 0.90 ± 0.05 for distance and for near it was 0.61 ± 0.05. After the intervention, the acuities improved significantly for distance (0.2 ± 0.27; P < 0.0001) and near (0.42 ± 0.17; P = 0.001). The most common reported difficulties were related to their academic activities like copying from the blackboard (80%), reading textbook at arm's length (77.2%), and writing along a straight line (77.2%). Absolute raw score of disability pre-LVD was 15.05 which improved to 7.58 post-LVD. An improvement in functional vision post visual rehabilitation was especially found in those activities related to their studying lifestyle like copying from the blackboard (P < 0.0001), reading textbook at arm's length (P < 0.0001), and writing along a straight line (P = 0.003). Conclusions: In our study group, there was a significant improvement in functional vision post visual rehabilitation, especially with those activities which are related to their academic output. It is important for these children to have an early visual rehabilitation to decrease the impairment associated with these decreased visual output and to enhance their learning abilities. It has been documented that in patients with visual impairment, subjective complaints do not necessarily correlate with objective measurement of difficulty. This holds true especially in pediatric age group since children with visual impairment often cannot express their difficulties. Moreover, there is paucity of literature on how the functional vision performance of children improves after usage of LVDs. The LV Prasad-functional vision questionnaire (LVP-FVQ), developed by Gothwal et al.,  has made use of direct questions about the daily activities of children to assess the self-reported functional abilities of visually impaired children. In the present study, we have used the LVP-FVQ to evaluate the impact of vision rehabilitation on functional vision of children with visual impairment. A total of 92 visually impaired children in the age group of 6-16 years attended the low vision clinic at Dr. Shroff's charity eye hospital over a period of 6 months (1 January 2012-30 June 2012). The inclusion of children in the category of visually impaired was as per the criteria of the World Health Organization for low vision. The study was approved by the institutional review board and adhered to the declaration of Helsinki. A total of 35 children who were able to perform standard clinical vision tests and could correctly understand and respond to the questions were included. Children less than 6 year old, those with other disabilities in the form of intellectual impairment or hearing loss and those who had been using LVDs earlier were excluded from the study. Nature of the study and the possible outcomes were explained to the parents in detail and an informed consent was taken. A complete ophthalmic history was taken including the visual requirements of the child, followed by a detailed ophthalmic examination. Unaided distant and near visual acuity (line acuity) was measured unilaterally and bilaterally using Logarithmic visual acuity chart "2000", charts 1 and 2 ( Precision vision, USA) at 3 m and LVRC − Near Visual acuity test card (Low vision Resource centre, HK) at 40 cm (converted from N to M notation and thereafter to logMAR) under standard room illumination. Dilated retinoscopy was undertaken wherever indicated. Other tests of visual function were undertaken as and when required, including color vision, contrast sensitivity, visual fields, and visual electrophysiological tests. Before initiation of low vision rehabilitation, a counseling session was undertaken with the parents to assess the visual needs of the child, to explain them the nature of visual impairment, and the possible influence as well as limitations of usage of LVDs. Thereafter, as per the visual requirements of the child, a trial of LVDs was given, keeping in mind the socioeconomic status of the family. The initial magnification power used for telescopes was predicted from the ratio of the denominator of the measured visual acuity to denominator of the desired visual acuity. LVDs for near: The required starting addition was initially determined using the Kestenbaum's rule (using the reciprocal of the distance visual acuity to calculate the dioptric power of the addition) and the ratio rule (comparing near visual acuity to target acuity). The reading addition power was again tested with the school books (continuous text) for all children. These include illumination devices such as lamps and reading stands, writing guides, bold-lined note books, and large printed books. All children and their parents were given training sessions to familiarize them with the use of LVDs; care and maintenance of the devices was also explained. 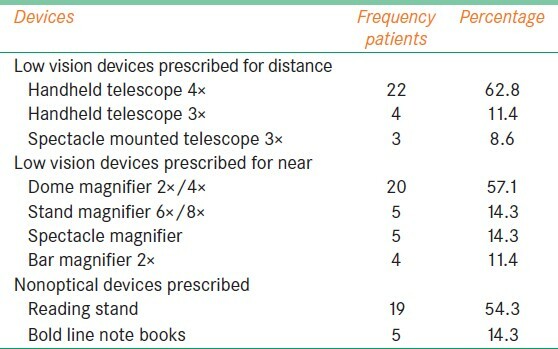 The types of LVDs prescribed to the subjects are listed in [Table 1]. At 2 months of initial dispensing of the LVDs, improvement in visual acuity was noted and the LVP-FVQ was readministered to the child by the same examiner. Statistical Package for the Social Sciences (SPSS; ; version 16.0) was used for statistical analysis and the Chi-square test was performed to assess the difference in functional vision post-LVD; P < 0.05 was considered significant. The LVP-FVQ was translated into Hindi (consistency checked by back translation in English) and administered to the child while away from the parents before and at 2 months of initiation of low vision rehabilitation in form of an oral interview. The questionnaire has 19 questions designed to cover four domains: Distance vision (six), near vision (six), color vision (two) and visual field (five). These 19 questions are related to difficulties in performing certain tasks which mainly rely on visual capabilities. An additional question 20 is related to global self-assessment of the child's vision as compared with his or her friends with normal vision. The response is graded on a 5-point scale (0-4); a ''Yes'' or '‹No'' response is first required for each question. If the answer was ''No,'' it was recorded as ''No difficulty'' (zero score). If the answer is ''Yes,' then the difficulty level is further categorized into 1-4 category; score 1 refer to ''a little difficulty'' and score 4 to ''unable to do the activity due to visual reasons.'' In instances that are gender-specific like threading a needle or lacing the shoes, an additional response of '‹not applicable'' is used. There were a total of 35 children, mean age 10.5 ± 3.2 years (range: 6-15 years), male:Female ratio was 4:1. All children had visual problems either since birth or early years of childhood; none of the children had received low vision specialist support earlier. A total of 28 (80%) of children were going to regular schools, while 5 (14.3%) children were attending special schools for the visually impaired; 2 (5.7%) were not going to any school (had been attending regular school earlier). As per the World Health Organization classification,  there were 13 children in group-I (moderate visual impairment), 17 in group-II (severe), and 5 in group-III (profound). The various etiological factors are summarized in [Table 2]. The details of LVDs prescribed are given in [Table 1]. LogMAR visual acuity prior to the introduction of LVDs was 0.90 ± 0.05 for distance and for near it was 0.61 ± 0.05. After the intervention, the acuities were improved significantly for distance (0.28 ± 0.27; P < 0.0001) and near (0.42 ± 0.17; P = 0.001). Total raw score of disability (score-4) pre-LVD was 15.05 (range: 2-27) which improved to 7.58 (range: 0-24) post-LVD. The response to the LVP-FQL pre- and post-LVDs is summarized in [Table 3]. It is pertinent to mention that we had subjected our patients to a 5-point rating scale; however, we observed that all children tended to dichotomize their response, that is, they preferred to use either 0 or 4 category (the most extreme category). The most commonly reported difficulties in this study were related to their studying/reading lifestyle like copying from the blackboard (80%), reading textbook at arm's length (77.2%), writing along a straight line (77.2%), and in certain generalized activities like locating dropped objects within the classroom (68.6%), reading the bus numbers (65.7%), and other details on the bus (62.8%). In response to Question no. 20, 85% of children felt that their vision was much worse than their friends' vision; rest felt that it was a little worse than their friends. We found that the difference in functional vision pre and post-LVD was statistically significant with those activities related to their studying/reading lifestyle like copying from the blackboard (P < 0.0001), reading textbook at arm's length (P < 0.0001), writing along a straight line (P = 0.003), and in certain other generalized activities like applying paste on tooth brush (P = 0.001) and in making out whether somebody is calling you by waving his/her hand from across the road (P = 0.001). In the present study, we have used the LVP-FQL to measure the improvement in functional vision performance in children with low vision postrehabilitation. In the original study done by Gothwal et al.,  and in another study using the LVP-FQL by Boshra et al.,  it was found that probability of children using category 1, 2, 3 was nearly zero. We had a similar observation that children in our study preferred to dichotomize the response, that is, they could either perform the task or could not and were not able to grade their difficulties. Boshra et al.,  concluded that that this could be because most children had visual impairment since birth or early childhood and thus could not judge the level of severity. A number of studies have documented an improvement of visual acuity in children with low vision, following use of LVDs. ,, Our study is first of its kind since we have made use of assessment of functional vision of the child using a time tested questionnaire for evaluation of outcome of low vision rehabilitation in children. Another important finding in our study was that none of the children had received any specialist support earlier. Pal et al.,  did a study on 703 children attending blind schools and ascertained the need for spectacles and LVDs in children with useful residual vision. They concluded that there is large potential for these ''incurably blind children'' to benefit by use of spectacles and LVDs and emphasized the need of visual rehabilitation in these children. Khan et al.,  analyzed the perceived barriers to provision of LVDs among ophthalmologists in India and concluded lack of training/knowledge, lack of awareness, and nonavailability of LVDs as the major barriers. They emphasized the importance of increasing knowledge and awareness of ophthalmologists about the benefits of low vision rehabilitation. To summarize, vision impairment if acquired early in life has a multifactorial impact on development of a child affecting the psychological and cognitive skill development; however, since most of the educational inputs are through visual sense, educational/academic output is one of the most affected and probably the most vital skill which is interfered with. 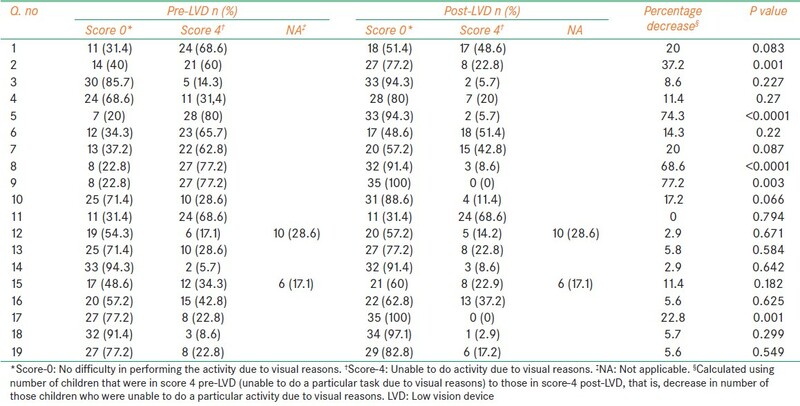 Making use of a time-tested functional vision questionnaire designed specifically for children of developing nations, we observed that low vision interfered with the routine academic activities of most of the children and that there was a significant improvement in these activities post use of LVDs. An early visual rehabilitation could strengthen their visual abilities, thus improving their learning abilities and enabling them to continue getting education with their normally sighted peers. 1. Shamanna BR, Dandona L, Rao GN. Economic burden of blindness in India. Indian J Ophthalmol 1998;46:169-72. 2. Daniel L Adams. 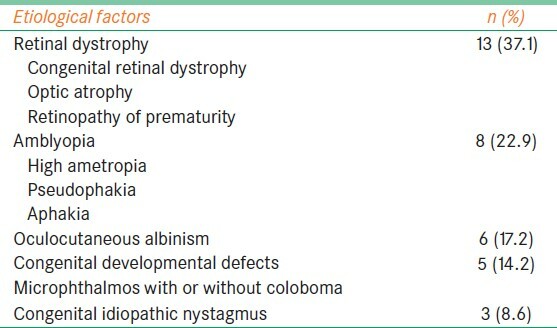 Normal and abnormal visual development. In: Taylor D and Hoyt CS. 3rd ed. London Elsevier Ltd. 2005. p 9-22. 3. Pascolini D, Mariotti SP. Global estimates of visual impairment: 2010. Br J Ophthalmol 2012;96:614-8. 4. Tabbara KF. Blindness in the eastern mediterranean countries. Br J Ophthalmol 2001;85:771-5. 5. Shaaban S, El-Lakkany AR, Swelam A, Anwar G. Low vision AIDS provision for visually impaired Egyptian patients-A clinical outcome. Middle East Afr J Ophthalmol 2009;16:29-34. 6. Friedman SM, Munoz B, Rubin GS, West SK, Bandeen-Roche K, Fried LP. Characteristics of discrepancies between self-reported visual function and measured reading speed. Salisbury Eye Evaluation Project Team. Invest Ophthalmol Vis Sci 1999;40:858-64. 7. Gothwal VK, Lovie-Kitchin JE, Nutheti R. The development of the LV Prasad-functional vision questionnaire: A measure of functional vision performance of visually impaired children. Invest Ophthalmol Vis Sci 2003;44:4131-9. 8. World Health Organization. Consultation on development of standards for characterization of vision loss and visual functioning. Available from: http://www.whqlibdoc.who.int/hq/2003/WHO_PBL_03.91.pdf [Last accessed 2013 Jan 23]. 9. Stelmack JA, Stelmack TR, Massof RW. Measuring low-vision rehabilitation outcomes with the NEI VFQ-25. Invest Ophthalmol Vis Sci 2002;43:2859-68. 10. Wolffsohn JS, Cochrane AL. Design of the low vision quality-of-life questionnaire (LVQOL) and measuring the outcome of low-vision rehabilitation. Am J Ophthalmol 2000;130:793-802. 11. El Byoumi BM, Mousa A. Visual function of egyptian children with low vision and the demographic determinants. Middle East Afr J Ophthalmol 2010;17:78-82. 12. Kansakar I, Thapa HB, Salma KC, Ganguly S, Kandel RP, Rajasekaran S. Causes of vision impairment and assessment of need for low vision services for students of blind schools in Nepal. Kathmandu Univ Med J (KUMJ) 2009;7:44-9. 13. Labib TA, El Sada MA, Mohamed B, Sabra NM, Abdel Aleem HM. Assessment and management of children with visual impairment. Middle East Afr J Ophthalmol 2009;16:64-8. 14. Pal N, Titiyal JS, Tandon R, Vajpayee RB, Gupta S, Murthy GV. Need for optical and low vision services for children in schools for the blind in North India. Indian J Ophthalmol 2006;54:189-93. 15. Khan SA, Shamanna B, Nuthethi R. Perceived barriers to the provision of low vision services among ophthalmologists in India. Indian J Ophthalmol 2005;53:69-75.